Nothing says "New York City" like a view of the Brooklyn Bridge. Completed in 1883 after 13 years of construction, this land marked suspension bridge crosses the East River to connect Brooklyn with Manhattan. If you really want to see the Brooklyn Bridge in all its glory, there a few spots around the city you'll want to visit. The Brooklyn Promenade Park, a stretch of land that runs along the East River on the Brooklyn side, will give you a wonderful view of the Bridge. The Promenade is not difficult to get to. Take the A or C train to the High Street Station, and walk west towards the East River. Another fantastic view of the bridge is from the South Street Seaport. From South Street, you'll get a spectacular view of three of the East River Bridges. Taking a nice stroll across the Brooklyn Bridge is a great way to get a fantastic view of both Brooklyn, Manhattan and beyond. Depending on your pace, the walk will take from 20 minutes to an hour. Brooklyn Side - There's a ramp to the pedestrian walkway on Adams street and on Cadman Plaza West. It is free to cross the Brooklyn bridge both in vehicle and on foot. Brooklyn - Take the A or C train to High Street/Brooklyn Bridge Station and follow the signs. Gray Line New York Sightseeing Tours Bus - Brooklyn Loop. Click for more details. 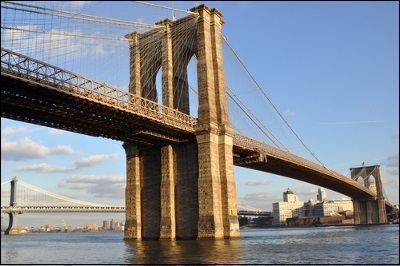 The Brooklyn Bridge was built between 1869 and 1883 and it opened to traffic on May 24, 1883. The Brooklyn Bridge cost $15 million to build. According to the NYC DOT, more than 120,000 vehicles, 4,000 pedestrians and 3,100 bicyclists cross the Brooklyn Bridge every day.